2/12/2007 — Acquisitions — Paris, Musée du Louvre and New York, Metropolitan Museum — The Louvre is exhibiting until December 3 as its painting of the month a work by Carl Gustav Carus (ill. 1) which entered its collections recently thanks to the patronage of the Compagnie de Saint-Gobain. This painting, purchased from the Katrin Bellinger Gallery (which had presented it at the last Maastricht Art Fair) is the first by the artist to enter a French museum. At the same time, by a strange coincidence, the Metropolitan Museum also acquired a Carus (ill. 2), who until now was not represented in its holdings, from the Thomas Le Caire Gallery in Hamburg. 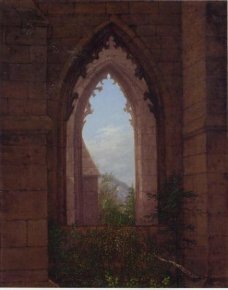 Carl Gustav Carus is less well-known than his fellow countryman Friedrich to whom he might be compared. 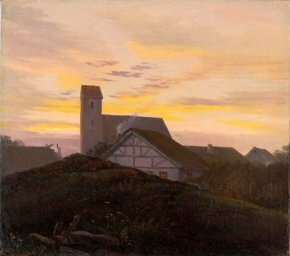 Just like his older friend (Friedrich was born fifteen years earlier, in 1774), Carus painted desolate Romantic landscapes, often sunsets or night scenes. The human figure, when present — which is not the case in either of these works — is barely silhouetted. The Louvre canvas, a sunset, with its subtle coloring of yellows and beiges is more representative of Carus’ painting than the one acquired by the Metropolitan which with its Gothic architecture recalls the background of certain troubadour works by Louis Daguerre or Charles-Marie Bouton from the same period. The composition’s boldness and the absence of anecdotal narrative reveal however a different spirit. The text of the Louvre describing this acquisition pays tribute to Saint-Gobain’s patronage, a discreet but exemplary action which has enabled Germanic and Scandinavian artists of the eighteenth and nineteenth centuries to enter the Louvre previously lacking works from this school. We will soon cover other recent acquisitions by the Metropolitan in a future News item.